You can cancel your HappyFox Chat account subscription from the billing section inside the HappyFox Chat app. 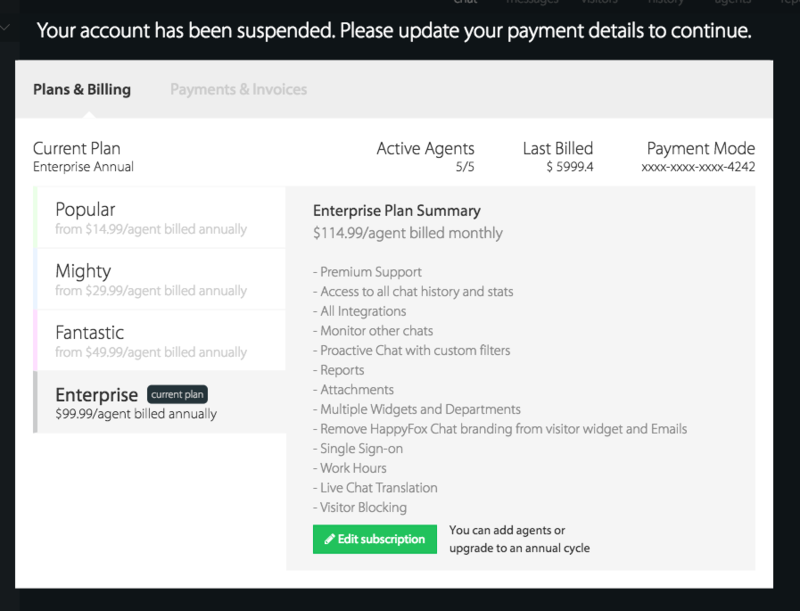 Only admin role enabled agents can cancel the account and you must have subscribed to any of the paid plans. The secret code for cancellation will be sent as email to the account owner. How to cancel active HappyFox Chat subscription? 1. Login to your HappyFox Chat account. 2. Click your profile name located on the bottom left corner and choose 'Billing' from the menu. 3. Click on the "Edit subscription" button. 4. 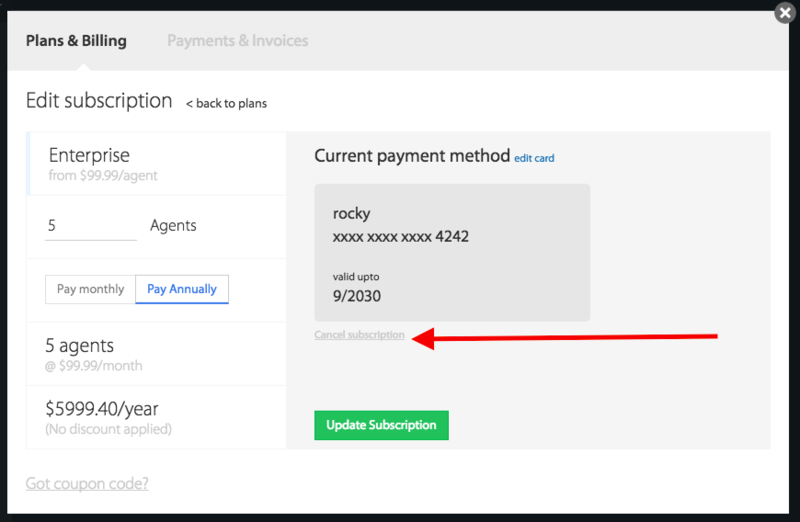 Click on the "Cancel subscription" hyperlink that is present on the form. 5. 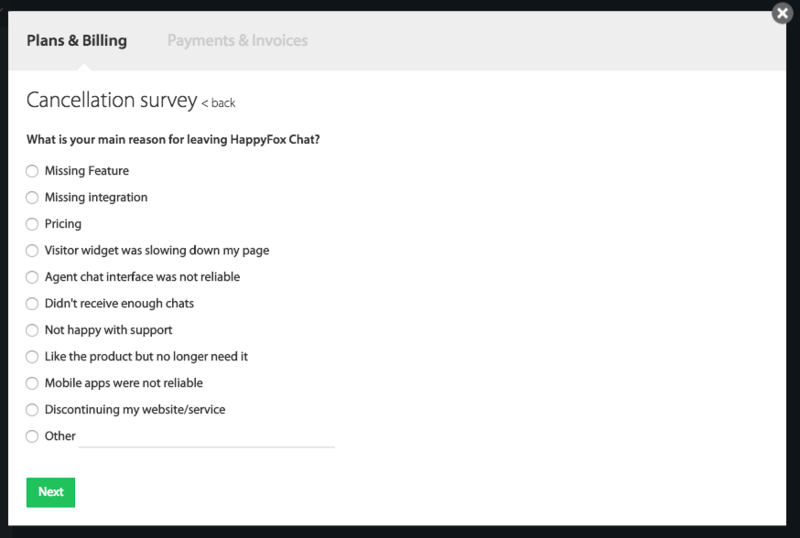 HappyFox Chat requires you to fill up a feedback on why you are cancelling the subscription. 6. Once you have successfully provided the feedback and click "Finish", the owner of the account will receive an email with a six digit secret code. 7. Enter the secret code in the form that is displayed and click on "Cancel my subscription" button. Note : The secret code is valid only for 30 mins. You can also resend the secret code from within the app. a. All the admins will receive a mail containing information about the account cancellation. b. The HappyFox Chat widget will hide from your website automatically. c. Non-admins will not be able to login to the account. 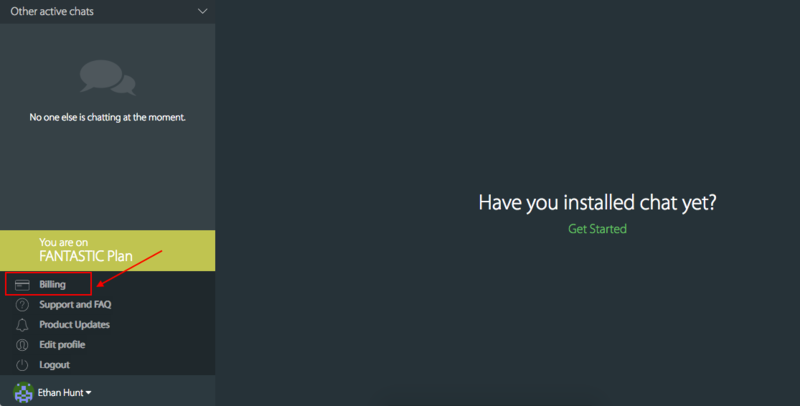 d. You will be logged out from Mobile apps and desktop apps automatically. 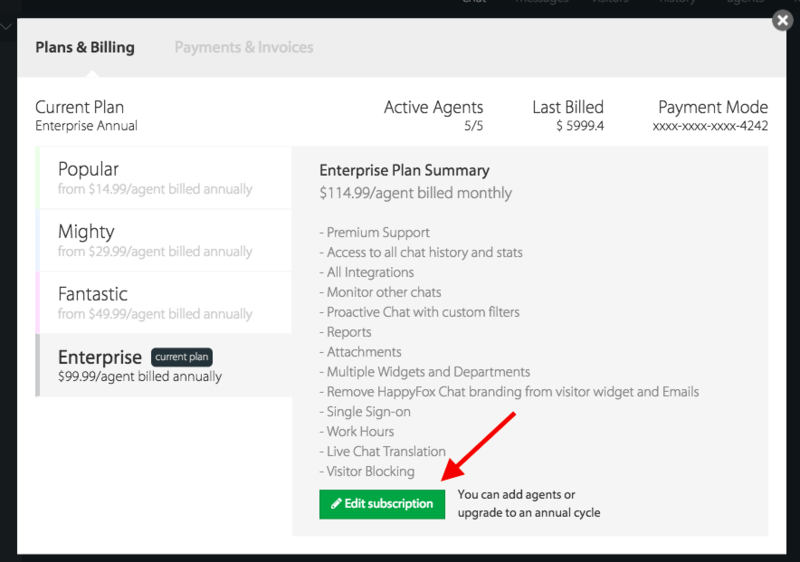 Account administrators can login, access the billing section and may subscribe to HappyFox Chat account again by clicking on the "Edit Subscription" button and then "Update Subscription". How to cancel a HappyFox Chat trial account? The HappyFox Chat trial account will be automatically suspended once the 14 day trial ends. To use your HappyFox Chat account after trial ends, you can login as admin and upgrade to one of our plans.